And you can automatically lower temperature settings, especially at night when you're sleeping and during the day while at work. 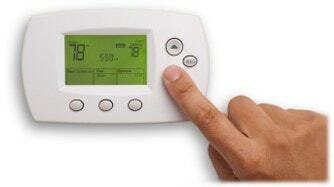 The Department of Energy says that setting the thermostat 5 degrees lower for just 8 hours per day can save up to 5% in energy costs. Used properly, it can save you up to $200.00 per year. Yes it will cost you upfront, but with the money you'll save on heating costs due to increased efficiency, a new system will end up paying for itself. Plus you will have the peace of mind of having a brand new warranty, so no expensive repair bills to worry about. If you can't afford a new system, at least have your existing system cleaned and serviced before each heating season. Switch to a Utility company budget plan... This will average-out your monthly payments. You will still spend the same amount per year, but you won't get hit with any huge Winter heating bills. Fireplace damper... When your fireplace is not in use, make sure the damper is set to the closed position. An open damper is just like having a window or door open; allowing heated air to escape the house. Limit the use of your fireplace... Experts agree that the typical fireplace loses more heat than it generates. This is especially true in colder climates. As the smoke rises up through the chimney, the heated air from your home follows right behind. Consider installing a fireplace insert which will make better use of the heat generated in your fireplace. Install a central humidifier... By using a Humidifier during the heating season, not only will you be more comfortable but you can lower your thermostat by two degrees and feel just as warm while saving money on your heating costs.